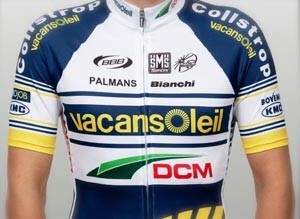 The Vacansoleil-DCM was presented at the Vaeshartelt Castle in Maastricht, in the Netherlands province of Limburg today, with twelve new riders included in its 29-man roster for 2012. The team’s general manager Daan Luijkx introduced his riders, expressing satisfaction with his new acquisitions, but also happiness with the development of the Dutch ProTeam’s existing young riders. As well as the riders, Luijkx praised the professionalism of the team, particularly since former Dutch sprinter Jean-Paul van Poppel joined as a directeur sportif last year. Among the ten riders to be leaving the team this year is 2010 Vuelta a España runner-up Ezequiel Mosquera, who, following his positive test hydroxyethyl starch at that race, sat on the sidelines all year and never raced in a Vacansoleil-DCM jersey. The team has managed to recruit a number of high-profile riders, including Dutch sprinter Kenny van Hummel from Dutch rivals Skil-Shimano [now 1t4i – ed], Swedish time trial champion Gustav Erik Larsson from Saxo Bank-SunGard, and aggressive Spanish rider Rafa Valls from the disappearing Geox-TMC. Those that remain include two-time Ronde van Vlaanderen winner Stijn Devolder, Classics specialist Björn Leukemans, Dutch champion Pim Ligthart, French sprinter Romain Feillu, emerging Dutchman Poels and Belgian De Gendt, and, of course, Tour de France hero Johnny Hoogerland. With its newly strengthened line-up, Luijkx expects his team to be contending in the biggest races, rather than just being the protagonist. “In last year’s Tour de France we were glad when we were in the breakaway of the day,” he said. “Now we expect more than just that. We have the riders for it. The ambitions are clear: a final top ten ranking and a stage win in one of the Grand Tours and a podium finish in a monumental Classic. “And I'm really looking forward to the World Championships in Valkenburg too,” he added. Remaining in the team: Wouter Mol, Wout Poels, Pim Ligthart, Lieuwe Westra, Martijn Keizer, Rob Ruijgh, Johnny Hoogerland, Sergey Lagutin, Frederick Veuchelen, Thomas De Gendt, Romain Feillu, Stijn Devolder, Marco Marcato, Björn Leukemans, Matteo Carrara, Mirko Selvaggi, Marcello Pavarin. New riders: Bert-Jan Lindeman (trainee), Barry Markus (trainee), Kenny van Hummel (Skil-Shimano), Martin Mortensen (Leopard Trek), Kevin Van Impe (Quick Step), Gustav Erik Larsson (Saxo Bank Sungard), Kris Boeckmans (Lotto), Stefan Denifl (Leopard Trek), Tomasz Marczynski (CCC-Polsat), Jacek Morajko (CCC-Polsat), Rafael Valls Ferri (Geox-TMC), Nikita Novikov (Itera-Katusha). Leaving the team: Joost van Leijen, Jens Mouris, Gorik Gardeyn, Borut Bozic, Alberto Ongarato, Ezequiel Mosquera Miguez, Michal Golas, Santo Anza, Ruslan Pidgornyy, Maxim Belkov.